Some viewers of my website may think, “Why does this guy only show black and white photographs on his website?” I would like to explain. I do not photograph with normal digital cameras, which would capture in color. My digital camera is Leica M Monochrom, which only allows you to capture in black and white. You may be freaked out, or unable to understand what I just described. There is such a kind of camera. I do not follow how it is made, though. I had been photographing with black and white films for over twenty years before I switched to digital (I still own darkroom gadgets!). I could continue photographing with normal digital cameras, but I prefer visual restriction without color. It is still important for me to see in black and white in front of the subject. For the love of black and white photographs. 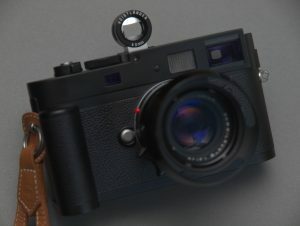 My Leica M Monochrom with Voigtländer optical viewfinder. Photographed by normal digital camera.